How to clean and condition leather furniture? To install at home a 3 piece leather furniture set is equal to letting in the house 7 cows! Leaving aside possible manufacturing defects, no two animal skin can have identical aspects. Skin is a natural product on which is written the complete life of the animal. To expect a bull skin with no defects is just as utopian as to expect an aged man to have baby skin. Through successive sorting, the tanner finds the skins that are best suited and for each, the most appropriate tanning method. 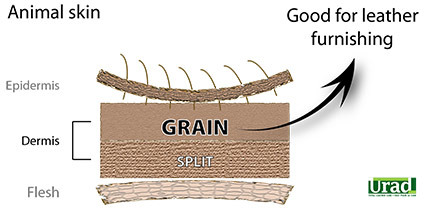 While major defects cannot be accepted in the center of a cushion, minor defects can be hidden with the Full Grained Pigmented tanning process. These requirements, specific to leather furnishing, justify in part why the raw materials account for a large portion of the cost of any leather furniture piece. Cattle accounts for the major part of skin supplies in leather furnishing. Skins from Northern Europe, Germany, Switzerland and Austria are most valued for having breeding conditions and slaughter methods resulting in skins with very few defects. Its full grain (part of the skin used to make leather) is remarkable for its softness but is more fragile than one of an adult animal. Buffaloes love wetlands where parasites are in volume. Wildlife conditions of these animals can leave many visible defects and result in depreciated value of their skins. That is why today, the essential part of buffalo skins are from young breaded animals. The impressions on buffalo's skin grain are made by the implantation of wide and regular hair shafts. Through various methods, the grain can be accentuated to give a more rustic aspect to the leather. Aside from calf skin, more fragile, other cattle skins are pretty much equal when it comes to strength and resistance. Essentially, the difference lies in the surface aspect. These differences depend as much on zoology then on the art of tanning. The tanner's know-how and the furniture maker's skills are precisely what makes it possible to best exploit the raw material. And a great paradox it is: skins are sub products taken from the slaughter house left overs, but because of the craftsmanship of the tanner, the leather which comes out of his workshops is one of the noblest products there is! In France, a decree made compulsory a standardized labeling which specified the type of material, the animal species and the finishing of the leather product. Rare are those manufacturers, however, who follow the guidelines... Still, we hope other countries will adopt this kind of measure. Before you make a purchase, don't hesitate to ask for any and all essential information pertaining to the leather article. This can include having the type and quality of the leather written directly on the bill. A leather which has kept its full grain, has a naturally textured full pored surface. The deep aniline coloring is achieved with dyes. It may or may not have a thin transparent finishing coat.